Before 1752, when Moravian Bishop August Gottlieb Spangenberg visited the Blowing Rock area, the windy cliffs of the area were home to the Cherokee and the Catawba Indian tribes, hostile to each other, and the basis for the story of “The “Blowing Rock”. Two star-crossed lovers, one from each tribe, were walking near The Rock when the reddening sky signaled to the brave that he must return to his tribal duty, and the maiden urged him to stay with her. His desperation in choosing between duty and love caused him to leap from the edge of the gorge toward the rocks below, while the maiden beseeched the Great Spirit to bring him back to her. The famous winds of the John’s River Gorge blew her lover back into her arms, and this legend about The Blowing Rock is still told today. After the mid-eighteenth century, when the Scotch-Irish began to settle close to this area, the passes from southern Virginia into Kentucky attracted many colonists, farmers, hunters, and trappers who continued south to the mountains of North Carolina. The first family to settle in Blowing Rock were the Greenes who were established by the mid-1800’s on a site that would become the Green Park Hotel property. Other early settlers in Blowing Rock included the Hayes, Coffey, Bolick, Estes and Storie families. About this time, summer residents began to come up from Lenoir to enjoy the cool fresh air, magnificent mountain views and the wonders of nature. As word traveled to other parts of the South about the merits of Blowing Rock, more visitors began to arrive, first camping out, and later taking rooms at boarding houses like the Hayes and Martin Houses on Main Street. When the space to accommodate guests proved too little, many homes turned into hotels, and the Watauga Hotel, built in 1884, added cottages in 1888; the Green Park Hotel opened in 1891 and was followed eight years later by the Blowing Rock Hotel. 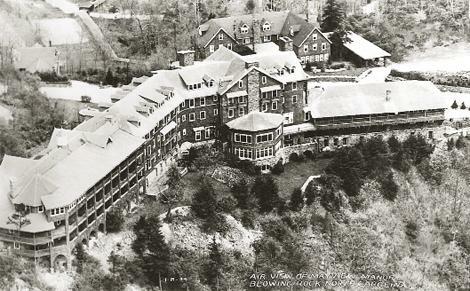 Walter Alexander touted the clean air and healthy environment of Blowing Rock, as he developed the Mayview area, opening the grand hotel, Mayview Manor in 1922. Times had been tough during the Civil War, when many early settlers sought refuge from the great war between the North and South. Husbands sent their wives and children to the safest place they knew at the time, the mountains, while they left to fight for their beliefs. After the war many men joined the families who sheltered here, and made their permanent homes in the village. Shortly thereafter, on March 11, 1889, Blowing Rock was chartered and incorporated. “Uncle Joe Clarke” became the first mayor of this fledgling little mountain town with a permanent population just over 300 people. High on the list of issues at a time when financial conditions were at a low ebb, was the tourist economy and meeting visitors’ needs for cleaner, better streets (dirt roads were the norm of the day) and the issue of farmers’ rights and the expense of fencing and feeding animals who had wandered the open range where food was readily available. Debated from 1893 until an ordinance for fencing in livestock was passed in 1896, this issue was reaffirmed in a township vote in 1900 and again in 1901. Blowing Rock’s economy would now be tourist-oriented and hotels, inns, and boarding houses could prosper. Activities and amenities for visitors reached the epitome of the finest offerings in lodging, food and entertainment for guests, and were enjoyed by many summer residents as well. Blowing Rock was becoming a destination community for those who fled from the heat down the mountain and as far away as Florida. The introduction of the automobile and improved roads shortly after the turn of century further enhanced the journey to the “Crown of the Blue Ridge.” Blowing Rock’s growth encompasses 1500 full time residents and approximately 8000 summer residents. The village offers the best of small town living: cool climate, magnificent views, year-round outdoor activities, a safe environment, beautiful churches, an award winning school and the finest accommodations with superb restaurants and shopping. A major preservation effort has been in place for the past decade to protect the proud historic heritage of the village and maintain the community character that so enhances this little town.